Toronto – October 20, 2014 – This past June, hundreds of UFCW Canada activists and community allies marched in the Toronto Trans Rally and March during the World Pride Festival, in solidarity with transgender people who too often face discrimination and violence because of their gender identity. Calgary – September 8, 2014 – UFCW Canada activists were loud and proud at this year's vibrant Calgary Pride Parade. The parade, held August 31, built on the momentum realized last year, with Calgarians lining the streets to show their pride and support for LGBTQ rights. Float entrants included some new and welcome faces, including four professional sports teams, marking one of the largest turnouts of professional athletes at a Pride Parade in Canada. Montreal – August 21, 2014 – UFCW Quebec activists joined more than 2,000 participants in the Montreal Pride Parade to show their support for the LGBTQ community and respect for the human rights of all. Halifax – August 7, 2014 – UFCW Canada Atlantic activists proudly joined thousands of other participants at the Halifax Pride Parade, July 26. 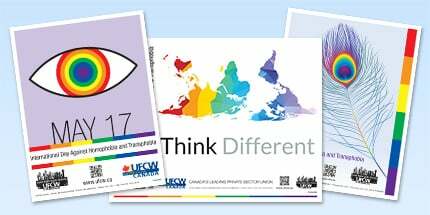 The parade was part of the 27th Annual Halifax Pride Festival and featured 106 floats — including a UFCW Canada float sponsored by the UFCW Canada Eastern Provinces Council (EPC). Vancouver – August 5, 2014 – Members, staff, and officers from UFCW Canada Locals 1518 and 247 were loud and proud the 2014 Vancouver Pride Parade on August 3rd, where UFCW Canada played a leading role as part of the multi-union delegation that participated in the Parade. Woodbridge, Ont. – July 23, 2014 – Rainbow flags flew high over Brockville, as UFCW Canada Local 1000A members, activists and staff joined many others in marching through the city’s downtown.